Comté is hands-down one of my favorite cheeses. It's both nutty and fruity at the same time, and its elastic, semi-firm texture makes it a perfect melting cheese (it's often a key component in a fondue). It's almost identical to its more famous cousin, Gruyère, which is what the Swiss call the cheese. But just over the Alps in the Franche-Comté region of France, they call it Comté. In case you missed it, I was on WNYC--New York City's NPR affiliate --a couple week's back talking to Brian Lehrer about Stinky Cheese. If you follow that link you can listen an mp3 of my segment (also copied below). You can also see the comments that people left, some of which are pretty hilarious. All this talk of turkeys makes me think of...cheese! Nothing says fall like Vacherin Mont d'Or, a small washed rind round made in the Alps on both sides of the French/Swiss border. Also known as Vacherin du Haut-Doubs (but not to be confused with Vacherin Fribourgeois), it is traditionally made with late-season cow's milk that is too high in fat and protein content to make Comté or Gruyère. Because of this the cheese is aged for a much shorter period of time than Comté and Gruyère, and so peak ripeness is usually seen in the fall and winter months (October through March). At peak ripeness, the cheese is soft and runny, and is therefore wrapped in a spruce band and shipped in a circular wooden box. Since the cheese spends a fair amount of time in this environment, the wood lends a subtle flavor to the finished cheese. The golden rind, which still shows imprints from the cheesecloth used during production, hides a pale yellow, unctuous yet mild paste. The cow's milk used to make Vacherin Mont d'Or is typically raw, but since the cheese is only aged for three weeks, specimens found in the US are necessarily pasteurized. Enjoy with a Beaujolais Nouveau, another autumnal delight! 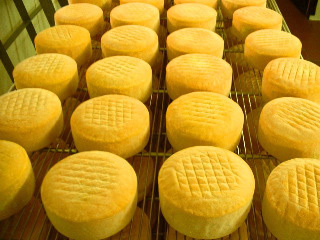 From New Jersey's Valley Shepherd Creamery comes this delectable washed-rind stinker made from the mixed raw milks of cows & sheep. The rectangular log has a white-ivory pâte with a soft and friable texture scattered with small holes. The taste is strongly mushroomy with a piquant, salty background. This week's featured cheese is a washed-rind Taleggio-style cheese made from the raw milk of Meadow Creek Dairy's herd of Jersey cows. Cato Corner Farm, located 30 miles southwest of Hartford in Colchester, CT, produces some of the best artisanal raw cow's milk cheeses in the country. Run by a mother-son team, the farm has 30 Jersey cows that are raised on pasture without the use of hormones or subtherapeutic antibiotics. Made in Belgium by Chimay, the same company behind the fantastic Belgian beers of the same name, Chimay Grand Cru is a semi-hard pressed cheese made from pasteurized cow's milk. Aged for 6 weeks, this is a Trappist cheese in the best sense. It is fairly pungent, super creamy, and, best of all, delicious.